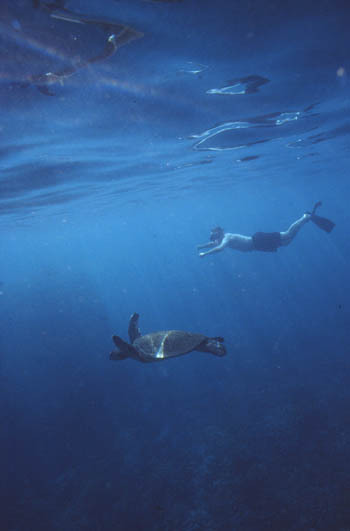 We did the Ocean Sports trip in December of 2000. It is only 40 minutes door-to-door from the Ranch to the Outrigger in Waikoloa where we met. The boat was a catamaran the Sea Smoke, clean and well-maintained, coast-guard certified for 50. We had 48 (44 + crew). Weather was nice, sunny and no wind to start with a great sailing wind towards noon. The boat was roomy and everyone could move around easily. 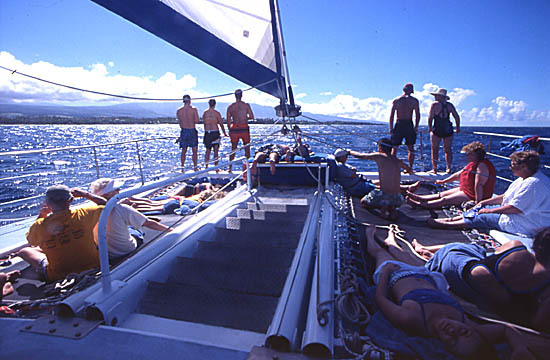 There was plenty of space on the foredeck to lie around and the canvas deck areas were very comfortable. The surf was up even though there was no wind so I suspect that the choices for snorkelling locations were quite restricted. Aside from the two turtles we saw, the place was uninteresting. The crew of four was extremely helpful, courteous, friendly and couldn't do enough for us. We had a great sail afterward and had a whale breach right next to the boat. We had a continental breakfast and a buffet lunch - both more than adequate for the trip with muffins, croissants, juice, tropical fruits, cold cuts & veggies, drinks and cookies etc. The trip lasted about 3 1/2 hours. 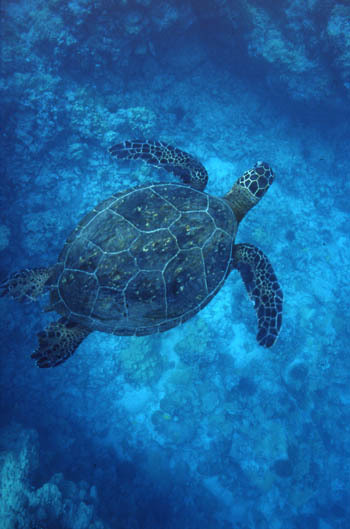 The Waikoloa coast is much more scenic than the Kona coast although Kona has more fish. This area of the coast can get quite windy and choppy. 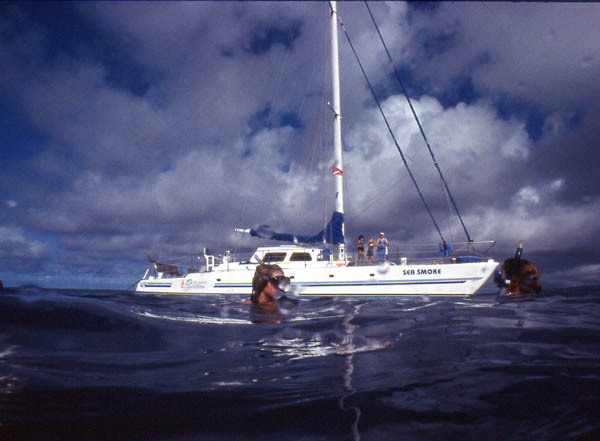 If you are a beginner swimmer/snorkeller, you might want to consider the Fair Wind cruise. For more information, see the Ocean Sports web site.